In July of 2015, I started using the Spring transcranial magnetic stimulation (TMS) device that was developed and approved by the FDA for migraine treatment. I've been sharing updates with you along the way. Now, with more than a year of data collected in my migraine diary, I can truly tell you how it's working for me. For those of you reading about the Spring for the first time, let's start with some background. The Spring is a prescription-only device that utilizes single-pulse transcranial magnetic stimulation (sTMS) to induce very mild electrical currents that can depolarize neurons in the brain. This process is thought to interrupt the abnormal hyperactivity associated with migraine. The device is designed for patient use and to be as portable as possible. To use during a migraine attack, the device is placed at the back of the head where the push of a button generates a focused magnetic pulse with the intent to eliminate a migraine. It was approved by the FDA for the acute treatment of migraine with aura on May 23, 2014. In the United States, it's now in clinical trials for migraine prevention. In Europe, it has been approved for the prevention of migraine with and without aura. When I started using the Spring in July of 2015, I was getting Botox treatments that had reduced the frequency of my migraine attacks from an average of 25 days a month to six to seven migraines a month. I was using Axert (almotriptan) to abort my migraines. When I first heard about the Spring, it was still in development, and I was so eager for it to be approved so I could try it. My fondest dream was that it would abort some of my migraines without triptans because triptans became contraindicated for me following a heart attack. It's not that simple though because my blood pressure spikes into stroke range then I get a migraine, and it stays there until the migraine ends. That has left me with a difficult decision every time I have a migraine: Which is riskier for me — stroke range blood pressure for hours or taking a dose of a triptan? My choice has been to take a triptan, and Axert has been my choice of triptans because it almost always works for me with one dose. To use the Spring, you turn it on and push a button to charge it. Once it charges, you push the buttons on the handles to deliver a single magnetic pulse to the back of the head. When I get a migraine, I do this three times to deliver three individual pulses, wait 15 minutes, then deliver three more pulses. I didn't want to be in the clinical trial of the Spring for migraine prevention because I'd have had to discontinue using Botox. Still, there was no reason I couldn't try it for prevention anyway, so I've also been delivering three pulses twice a day to see if it would help me with migraine prevention. As you can see from the charts below, the Spring is working for me both acutely and preventively. I'm now averaging just two migraines a month, and the Spring is aborting nearly 80 percent of them without the addition of any acute medications. Botox worked very well for me, reducing my migraine frequency by more than 70 percent. One problem, however, was that the Botox wore off about 10 weeks after the treatment, and my insurance company would only cover it every 12 weeks. That left me with more migraines two weeks out of every 12. When I went for my first Botox treatment after starting with the Spring, Dr. Watson and I noticed from my migraine diary, that my migraine frequency hadn't increased at 10 weeks as it had in the past. The same held true three months later, so we started increasing the number of weeks between Botox treatments. Finally, when I went to my latest appointment with him, it had been 20 weeks since my last Botox treatment, and there still hadn't been any increase in migraine frequency. This was the evidence we needed to decide that the Spring device was working preventively for me and was, in fact, doing even better than the Botox had. That made it easy to decide to discontinue the Botox treatments. 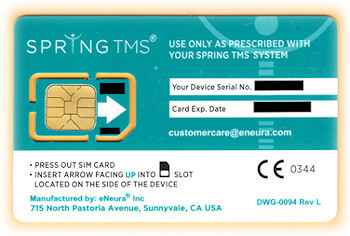 The Spring TMS device is available by prescription only and is not purchased outright. Because it's a prescription device, that prescription must be renewed by your physician. It can be renewed for three, six, nine, or 12 months. Each time the prescription is renewed, eNeura (the manufacturer and distributor) send a new SIM card that is inserted into the Spring device. A current SIM card must be installed for the device to work. The Spring device is categorized as durable medical equipment by insurance companies. The monthly rate for the Spring is $250. That rate is reduced if you renew your prescription for six or 12 months. eNeura doesn't bill insurance companies, so claims must be submitted to insurance companies for reimbursement. Since the device is still relatively new, it's not yet covered by all insurance companies, and it's not yet covered by Medicare. For people who have problems with their insurance companies, eNeura has contracted with a company to work with the insurance companies and try to get the charges covered. My insurance company will pay $450 of the $750 charge for a three-month prescription, essentially leaving me with a $300 copay. Since we've discontinued the Botox treatments, I'm now paying less for my migraine treatment. My co-pay on Botox was $512 every three months, $212 more than my co-pay for the Spring. The insurance company is saving money too. They were paying $1,500 every three months for Botox, $1,050 more than the Spring. So, in the course of a year, I save $848, and my insurance company saves $4,200. My savings would be higher if I had a co-pay for triptans, but a generic is available for Axert now, and I don't have a co-pay on generic drugs. Overall, I have to say that I never dreamed the Spring device could help me as much as it does. When I first heard about it, and while I was waiting for it to be available, my hope was that it would abort some of my migraines without my having to risk using triptans. I'd never even thought about it for prevention, but was certainly willing to try it for prevention too. 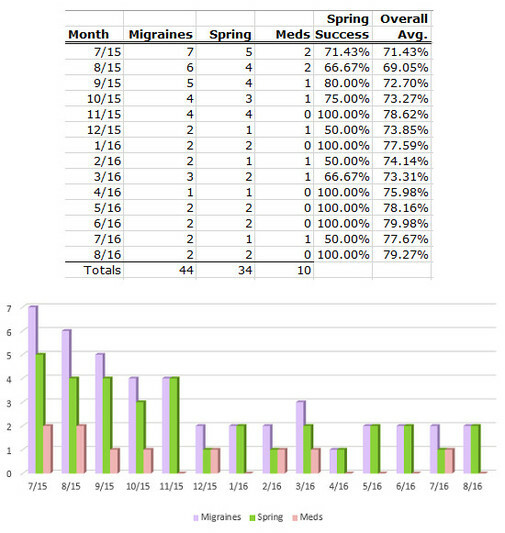 Thanks to the Spring, my migraine management and control are better than they have been in years. It comes with a travel bag with a shoulder strap, so it's easy to take it with me when I go somewhere. I've flown with it several times. At one airport, they did pull me out of the security line and check the device for explosive residue. The TSA personnel were very nice about it, and it held me up less than five minutes. That happened just once out of the eight times I've flown with it. The cost of using the Spring may seem a bit high at first glance, but for me, it's actually reduced medical costs. Of course, it would be wonderful if all insurance companies covered it immediately, but getting insurance companies to cover new devices takes time, and it takes people challenging and pushing them. When I started using the Spring, my husband and I discussed the cost, and agreed that we'd find the money to pay for it if the insurance company wouldn't cover it. The bottom line is that very few insurance plans cover everything, and health and quality of life are priorities for us. As with any migraine treatment, the Spring doesn't work for everyone, and trying it is the only way to know if it will work for you. If your doctor isn't a Spring prescriber, you can check with eNeura to find the prescribing doctor closes to you, or your doctor can contact them about becoming a prescriber by emailing eNeura.